Oft touted as one of the defining titles of the PlayStation 2 era and part of Squaresoft’s perfect last hurrah, it’s almost hard to believe that over a decade has gone by since the release of the original Kingdom Hearts. For many choosing their favorite entry in the series is a difficult task, but for me the choice is a little easier – the very first entry will always have a special place in my heart. 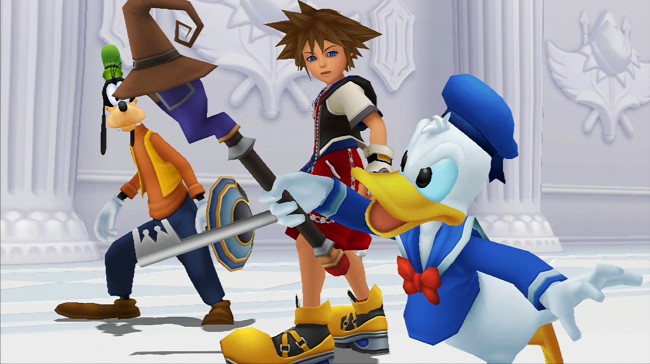 Adventuring with Sora, Donald and Goofy through the various Disney worlds was a magical thing in my younger years. Older now, I couldn’t have predicted the reaction those memories would evoke years later with this latest rerelease, Kingdom Hearts HD 1.5 HD ReMIX. Just how positive an experience it ended up being was quite unexpected. KH’s trio are at their best in their first meeting.For the first time ever, Kingdom Hearts Final Mix makes its way across the pond to western territories – marking the inclusion of previous Japan-only content such as extra bosses and tweaked gameplay mechanics. Kingdom Hearts Re: Chain of Memories and the cutscenes from Kingdom Hearts 358/2 Days have also been redone in HD and the addition of PS3 trophies help bring the titles into the modern age at a fair price of $39.99 for the whole deal. KH Final Mix in particular offers up a revision of the original textures, character models and even remastered and re-recorded the entire soundtrack. The gameplay systems – while mostly identical – have been tweaked to be a little more like Kingdom Hearts II with the camera now mapped to the right analog stick instead of the original’s R2/L2 placement. Square Enix has done an excellent job bringing the main title into the modern age. While the overall content in the Final Mix version is the same as the original Japanese PS2 release, several gameplay mechanics have been successfully streamlined from their original, often clunky nature. The main combat menu is scaled down to three options – Attack, Magic, and Item – and reaction commands from KHII appear as a Triangle command over enemies in order to execute certain abilities. Some gripes still remain, however, such as slight input delays that can hamper jump timing, the occasional camera hiccup and some encounters that really require nothing more than hammering on X repeatedly. Re: Chain of Memories offers up a different style of play – relying on a card-based battle system in place of the series’ typical menu command style. Of the three titles included in the package, this one is arguably the least altered from its original state. Instead, fans can look forward to new cards for use in the game upon completion of 358/2 Days. Remastered cutscenes from 358/2 are a great story addition, even if the game itself would have been preferable. 358/2 Days itself is not a game, but instead essentially three hours of cutscenes strung together in a chapter-based system. 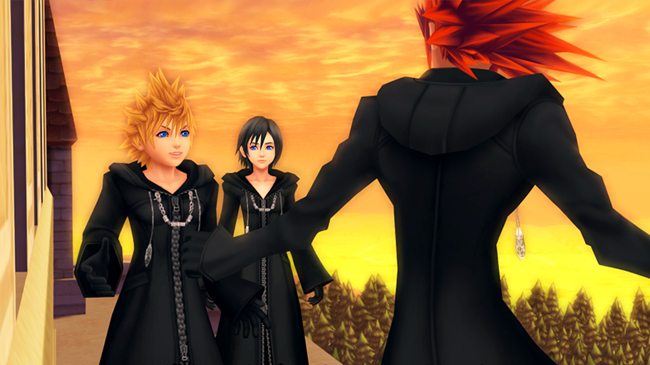 Events take place by days from the original DS game focusing on Roxas, Axel and Xion. Journal entries take the place of exploration, and despite pieces of dialogue having been cut from the original, does well enough a job to connect the rest of the larger story. At this point in the current console generation HD remakes and do-overs of last-generation titles are actually pretty commonplace – but within that crowded market, Kingdom Hearts stands out. I remember being impressed by the quality of the visuals all those years ago when the original version of Kingdom Hearts launched on PS2, and that remains here. The real star of the show is its unique art style, which lends itself to a high definition upgrade quite handily. Visually, the only gripes come from some of the unaltered models that stick out last a sore last-generation thumb. Textures here and there can be bland at times, but overall Square Enix has updated the ones where it really counts – and it shows. Lip syncing isn’t exactly stellar either, although the English voice overs do typically hold up quite well – specifically the familiar Disney cast of characters. Re: Chain of Memories remains the least updated in terms of visuals – opting for an easier HD bump due to better assets having been put in use at the time of its original PS2 release. 358/2 Days looks spectacular and proves the current KH art style is well enough for modern platforms. Bundling several games together seems to be the thing to do with HD remasters and while unconventional in omitting the direct sequel, Kingdom Hearts HD 1.5 ReMIX still offers up a value-for-money package and a lovingly created upres of a bonafide classic. The characters and story that fans fell in love with all those years ago remain intact, and various gameplay changes update the game to modern standards for the better – despite small discrepancies here and there in KH Final Mix. The resulting package serves as a welcome reminder of the impressive output of latter-day Squaresoft and is without doubt one the best HD revamps to date. Disclaimer: This review was based off final retail code of the English PlayStation 3 version of Kingdom Hearts HD 1.5 ReMIX provided by Square Enix. Read more about the Nova Crystallis review policy here. Posted in Kingdom Hearts, Reviews, Special. I’m guessing you haven’t played Days in a while, because gameplay wise it’s by far the weakest entry. What I meant was more, they could have essentially re-tooled it with a complete remake. But the problem with Days is the massive swaths of time where you literally are just doing fetch quests. I mean, 2/3’s of the game don’t advance the story at all. In your introduction Erren I found myself shivering! You made me remember my first KH experience… I really want to congratulate you again! Your articles are great! And with this review you made me anticipating the game more! I can’t wait for it! Friday, is the day when it’s released here in EU. Already preordered! Ōkami HD, Beyond Good & Evil HD. No they don’t. Whoops, that was meant for Tim Lomeli. Sorry about that. Sony will only rarely make exceptions for HD remasters, usually when the remastered game is a standalone. When a game is part of a series, they generally enforce the rule “No disc-based release unless it’s a collection”. Just received this today as an early birthday present, and am currently playing it! I finished off the Days scenes first, and was quite pleased (although disappointed about the lack of Marluxia). I am currently leveling in Traverse Town after having some great difficulty beating the boss of Wonderland. I’m playing on Proud Mode, Midday experience slope, and chose the Rod while discarding the Sword. At Level 13 (and after a quick stop in Olympus Coliseum to pick up Thunder), I’m about ready to try yet again. As a final note, the frequency with which Goofy uses potions to heal a sliver of damage is discouraging to me. Welp, grabbed Thunder and headed back to Wonderland… And beat the boss in a snap! Just grabbing Thunder made the fight a cakewalk, I didn’t even need the batch of Fire Rings and Potions I ground out all that Munny for. Ah well, I suppose it means I’m prepared for later challenges. Still, I liked the story, and I guess if I can get that through HD cutscenes, it shouldn’t matter.